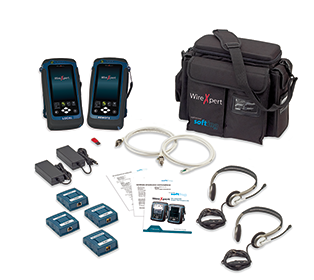 WireXpert 4500 sets new standards for user friendliness, with touch screen graphical interface at both Local and Remote units. The innovative design combines superior measurement accuracy with low cost of ownership and ease of use. 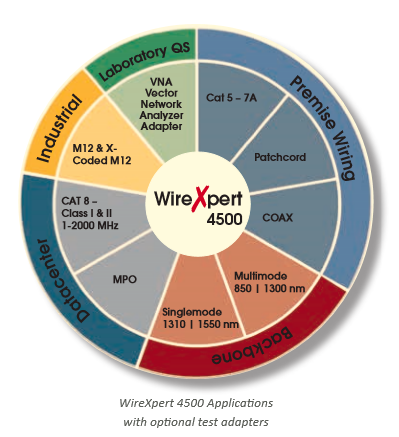 WireXpert is geared up for certifying beyond the widest frequency range of 1 - 2,500MHz. WireXpert comes with an intuitive touch sensitive user interface, featuring bright color LCD screens designed for industrial, heavy duty usage. The Dual Control System (DCS TM) – featuring identical devices for Local and Remote units – makes it really easy to operate the test cycles. Whether coordinated by two technicians or only one, walking time between outlets is minimized.